Some of the best moments in many years of being a metal fan came to me when I played an album by a total unknown entity and discovered a hidden or lost gem. This is regardless of the genre, but, I have to admit, those of melodic doom or deathdoom variety which struck me so positively and unexpectedly have carved a permanent niche in my memory. Yours truly brain will have to yield another ledge now, for Dutch Officium Triste and their 2004 release Reason being reissued these days by know-all-things-Dutch metal vic records. I am not joking, every fan of 2nd generation doomdeath which followed My Dying Bride in its path, those who enjoy bands like Yearning, Slumber or Novembers Doom have to get to know Officium Triste. The previous sentence pretty much gives away all five tracks on the album, but to say melodic doomdeath about Reason is not quite enough. Surprisingly, and almost not characteristically, the album exudes unbelievable amount of warmth, through its production, guitar tone and low but very legible vocals by the lead man Pim Blankenstein. Sure enough, the melodies on Reason are all in minor tone, and harmonies are absolute textbook, yet somehow melodic mass being constantly pushed by Officium Triste guitar pairing provides sweet sadness mixed with a great deal of hope (The Silent Witness, The Sun Doesn’t Shine Anymore). Keyboards are making rare appearance and it is the synth which provides cold counterpoints to warm melodic guitars. Just about every composition has this gentle touch of ice melted away by slowly pushing melodic plane. Reason compositions are rather long, perhaps with the exception of the opener In Pouring Rain, but they are never boring. Such is the sign of a great melodic doomdeath that you absolutely not notice the flow of time. Just immerse yourself in the glacial flow of The Silent Witness and beautifully titled The Sun Doesn’t Shine Anymore and follow along. 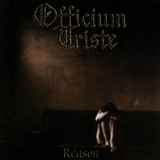 At the same time Officium Triste are also masters of accent and purposeful culmination on this album. Cold symphony of This Inner Twist buttressed by hammering heavy riffs unveils a funeral march melody, all ending in a thunderous closure. The beginning of A Flower in Decay strangely reminds me of Crimson Glory melody from The Other Side of Midnight on Astronomica, although this is probably just a coincidence. The final bagpipe-like moments of A Flower in Decay and the finale of The Sun Doesn’t Shine Anymore take my breath away, and In Pouring Rain breaks out in an unexpected Iron Maiden gallop, showing that Officium Triste are not averse to faster double bass moments when it is appropriate. It would be interesting to see if the band ever produced anything as awesome as Reason, and in a way I am almost willing not to find out. Let Reason just sit there lonesome on the pedestal it just created for itself.